"We'll Keep a Welcome in the Hillsides..........."
The pressure went up and some ragged cumulus started to form, driven by the brisk 20 knot north westerly breeze. 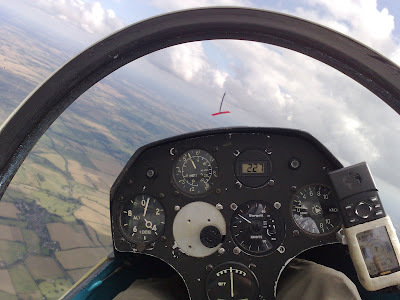 I launched at 13.50 and soon reached the 3000ft cloudbase. Setting off to the northwest wasnt easy in the weak broken climbs as no sooner had you begun than you were back again. 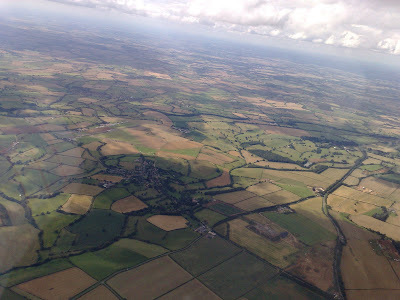 Eventually I broke free and on the Oxford plain things improved. A large shower area around Oxford was the biggest obstacle and after a low point from crossing a blue gap near Enstone I was finally up and away.
" We'll keep a welcome in the hillsides, we'll keep a welcome in the vales......" I could just imagine Gatfield joining in on the chorus. Yesterday was unexpectedly nice flying. 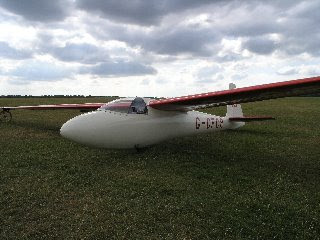 Was doing a joy ride in the Duo and launched about 13:30 into an unpromising sky (raining on the ground) but cloudbase quickly rose to 4000ft with good thermals and good streeting. 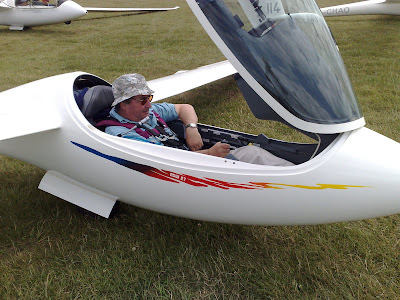 Flew down to DID and OXF mostly at cloudbase in 13kt Westerly. 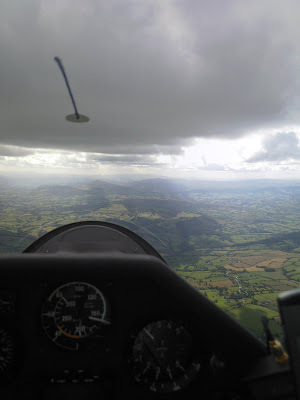 It did look a bit showery to the North but it was clearing steadily to the West with scattered Cu at 4000ft +. A little surprised there were so many landouts at LGC Regionals. Maybe went too early? The three sounding from the previous night all suggested completely different airmasses and Metcheck said the temperature wouldn't get above 19C. So, with that in mind I set off to the airfield thinking that I'd ignore the forecasts and just try to figure out what was happening with the weather. The two main cross-country indicators suggested that the forecast models were wrong (Dave-C set off on his milkrun 500km, Jim White muttered something about going on a 400km task). I decided to err on the cautious side and set a Cat's cradle task of Booker Bridge - Membury - Buckingham - Edgehill - Booker (224km) - mindfull of the airshow at Silverstone that was NOTAM'd. Five of us set off - me in 732, Jane in 118, Shack in A9, Jeremy in JDV and Chris in U2. U2 set off first and returned, literally minutes later, with a technical malfunction. My radio battery was flat so I don't know how everyone else went on - but Jane certainly made it as far as Membury and back and I ocasionally had glimpses of A9 on task. A nice day out in the end with climbs of 5-6kt to 5000'. Dave-C didn't finish his 500k because it begain to rain. I managed the 224km task, despite a few low scrapes and I thin Shack did too. Highlight of the day was just South of Banbury when the Vulcan flew beloe me (by several thousand feet!). Wasn't quick enough with the camera unfortunately. Oh to be in England now that April's Summer's here. A damp start to the Friday Evening Group! The 2009 Booker Regionals came to a close today with Serres Bimble Blogger, Songster and ex Volvo driver, Jon Gatfield, stepping up to receive the winner’s trophy. Third placed Jim White, appearing in his least interesting shirt of the week was lost for words! 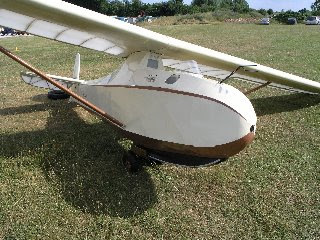 Jon flew his ASW 27 consistently well throughout the week in some challenging conditions. As he rightly said, when receiving the winner’s cup from Director and CFI Mike Collett; “ the competition was well directed, had outstanding met briefings from Dr Nils Wedi from the European Centre for Medium Range Weather Forecasting and superb task setting from Brian Forrest . All of us participating echoed these remarks. Mike Collett’s ability to direct soundly and wisely, the amazing accuracy of Nils’ forecasts and Brian’s uncanny knack of setting the right task in the right area all went to make it a really good quality event. Thank you guys for doing such a professional job. We all had a great time. And a big thank you too to everyone who gave up their time to help. In Particular; Heggie and the maintenance team for fielding five superb tugs, Bob Davey and the tuggies for the super quick grid launches that enabled us to grab Nils’ ‘weather windows’. Julian and the cadets for ground marshalling and wing running. Shelagh and Hillary for manning the office throughout and administering the entries, loggers and retrieves etc. Steve Brown for his dexterity in the scoring department . Gary Nuttall for the chatty blog and scores of members who helped out and whom I’ve not named. But lastly thanks to those pilots who participated, for your good airmanship throughout and the friendly and sporting nature of the comp. Booker members, you can all be proud! No improvement in the weather, so we scrubbed at 13.00. 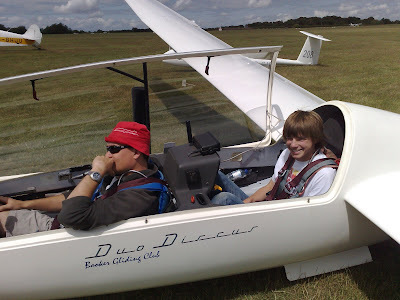 Briefing at 11:00 started with congratulations to Nils the Metman for geting both the forecast spot on and for getting 1000 points on the AAT in his Club Class glider by flying 289.4km. Today's forecast doesn't look promising, with the most optimistic outlook being a gap between the showers with cloudbase rising to 2000' and 30kt South-Westerly winds. However, we're going to hold on to see if the conditions improve sufficiently as there's fewer than 80 points seperating two pilots from the top place. Rebriefing, and probably a final decision, will take place at 12:00. After a successful task yesterday with most pilots completing tasks distances of between 200-300km the weather today doesn't look so promising. The general pessimism of the met forecast is well reflected by the notice on the board which reads "Briefing 11:00 - don't rig". Maybe there's a small hope of a modest task later? Only the one update today as things happened rather quickly and I was at the front of the grid. Briefing was at 10:30 and first launch was 11:15. Metman suggested strong 20kt Westerlies with minimal changes at height and no sheer. Cloudbase likely to be up to 4500' in parts with 8/8 killing off convection later. Booker Bridge (BOB) - Ilsley (ILS/10km) - Bozeat (BOZ/25km) - Bicester (BIC/10km) - Booker SW (BO1) - Booker Finish (BF1). This gave a range of 136.0km/334.1km (214.1km). Nearly everybody completed the task, with Steve Williams landing JDV at Thame and Jim Pengelly in 208 managing 61km before returning home. 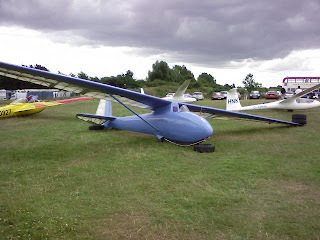 Provisional results can be found at http://www.soaringspot.com/include/booker2009/results/mixed/daily/day4.html. The most optimistic forecast Nils could offer today was a 1500'-2000' cloudbase interspersed with rain. No sign of improvement during the day. Therefore the decision has been taken to scrub early. Early indications are promising for Saturday with cloudbase up to 4500' towards the Midlands and East Anglia, although we'll have brisk Westerly/North-Westerly winds to contend with. Sunday is likely to be similar but with an increased possibility of showers. Being British weather it could all change in 24 hours, so we'll see what's announced at the briefing on Saturday. Metcheck isssued a Severe Weather Warning for parts of the UK and it looks like we may be getting some of the precipitation on the edge of the active cells. In fact, just heard a rumble of thunder which doesn't mode well. Briefing today will be at 11:00. Let's see if our tame Metman has anything more optimistic to say. We stuck with the 'A' Task and launched sometime after 11:00. Everybody set off under an 'interesting' sky and there were a few landouts later - William Parker in MH landed near Buckingham, Gary Nuttall in 732 decided to visit Bicester, Steve Williams nearly made it around the task and landed at Lewknor. Provisional results are out and can be found on the Regionals page . Below is a pic of 732 on its annual trip to Bicester. We had a briefing at 10:15 and the gliders are waiting on the grid. Metman says there's going to be a usable window and the top cover is likely to burn off. Today we can expect 10kt SW winds as the centre of the low pressure system is approaching. Expectation is cloudbase of around 3000' with thermals decaying to 1-2kts as the showers head in by 3pm. Task A - Booker Bridge (BOB) - Buckingham (BUC) - Olney (OLN) - Winslow (WSL) - Booker SW (BO1) - Booker Finish 1 (BF1) - 141.5km. Task B - Booker Bridge (BOB) - Silverstone (SIL) - Booker SW (BO1) - Booker Finish 1 (BF1) - 112.7km. Outlook is for it to be non-flyable tomorrow. Watch this space. looks like some quite menacing showers in the distance and the wind is still strong and gusty. Even the Red Bull aircraft have gone away. 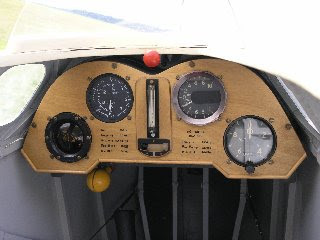 Booker Bridge-Thame Airfield-Membury-Booker SW - 125.2km. First launch after 13.30. It's now 14.30 and Z3 the sniffer is scuttling around. Airmass has decayed but we're not giving up yet. The low pressure system has moved into Scotland and is likely to be heading towards Scandinavia this evening. Meanwhile it's generating winds which will be 5-10kts stronger than yesterday. Likely to be a steady 25-30kts today but no wind gradient or shear expected - so less of a wave influence. Cloudbase is expected to be 4500'-5000' with 4kts climbs until 18:00. Outlook for Thursday is that there's likely to be a soaring window before the showers arrive later in the day. So the plan is to prepare for an early start tomorrow. Task A - Booker (BOO) - Booker Bridge (BOB) - Hurtsbourne Tarrant (HUR) - Marlborough (MAR) - Booker SW (BO1) - Booker Finish (BF1) - 149.8km. Task B - Booker (BOO) - Booker Bridge (BOB) - Newbury South (NES) - Welford (WEL) - Booker SW (BO1) - Booker Finish (BF1) - 105.3km. Some light showers, so we're going to prepare for launching at 13:00 in the hope that our Metman is wrong about the wind strength. Briefing is at 11:00. Strong winds expected (5-10kts higher than yesterday). Should make life very interesting! Results for the competition so far can be found on the Regionals 2009 page. We stuck with the 'A' task and started launching at 13:20. A very windy day which caught a few pilots out. Landouts included Nils in EN at Chiltern Park (soon joined by Steve Williams in JDV) and Jim White in J1M at Kingsclere. Several people made it as far as Basingstoke before heading back to Booker and a few actually completed the task. Results later! Forecast from Nils is to expect 8/8 overcast between 3000'-9000' until 13:00. This should then decay away leading to broken Cumulus with a base between 3500'-4000'. Showers are expected in the early evening giving us quite a small window of opportunity. Winds are expected to be South Westerly 15-20kts and these may bring in sea air which could help to dampen down showers in the area. Task A - Booker (BOO) - Booker Bridge (BOB) - Ilsley (ILS) - Basingstoke (BAS) - Chievely (CHV) - Booker SW (BO1) - Booker Finish (BF1) - 131.9km. Task B - Booker (BOO) - Booker Bridge (BOB) - Marlborough (MAR) - Rivar Hill (RIV) - Booker SW (BO1) - Booker Finish (BF1) - 138.5km. Task A is the currently declared task, with first launch not before 13:00. Initial indications are that conditions will be improving in the South tomorrow but decaying in the North. Let's see how the Club Class Nationals at Pocklington fares! Until the briefing at 11:30. Sky is overcast at the airfield but at least there's no rain. Yet. With no prospect of conditions improving we've scrubbed and are putting the gliders away. A shame because the forecast is for the next couple of days to be wet and windy. Ho Hum. Task A - Booker (BOO) - Booker Bridge (BOB) - Buckingham (BUC) - Oxford South (OXS) - Booker SW (BO1) - Booker - 113.4km. Task B - Booker (BOO) - Booker Bridge (BOB) - Towcester (TOW) - Didcot (DID) - Booker SW (BO1) - Booker - 151.2km. First launch not before 11:00. Six pilots completed the task, three landed out (114 near Buckingham, MH at Calvert Junction and A9 at Turweston), one switched to spamcan mode (208), a few didn't make it much beyond the start line (GA, 732, JDV and 161. So quite a busy day! Currently first place is jointly held by Jim White (J1M - photo above) and Matt Cook/Mike Gatfield (315 - photo below). With a couple more more loggers to be checked, it could all change by the morning. 12.00 came and went. Waiting for a clearance to appear. The clearance has arrived at the airfield along with the brisk SW'erly winds. Nils confirmed that it's going to be quite a good day with thermals expected with 3-4kts. Cloudbase anticipated to be 3500-4000' with a risk of it lowering later in the day if there's any mid-level spreadout. As the day goes on there's also a decreasing risk of showers. Booker Airfield (BOO) - Booker M40 Bridge (BOB) - Northampton South (NOS/20km cyl) - Moreton-in-Marsh (MOR/15km cyl) - Booker SW (BO1) - Booker Airfield (BOO) - Min 142.2km/Max 263.6km, act task distance 200.2km. Booker Airfield (BOO) - Booker M40 Bridge (BOB) - Towcester (TOW/15km cyl) - Chipping Norton (CHN/15km cyl) - Booker SW (BO1) - Booker Airfield (BOO) - Min 118km/Max 220.8km, act task distance 166.6km. First launch expected at not before 12:00. It's been raining throughout the night which doesn't auger well for the day. Metcheck suggests that it's going to become warm and dry though with temperatures locally around 21C and fairly brisk Westerlies. The satellite pics show it clearing over Cornwall and it looks like it'll be quite bright and sunny as the frontal system heads towards the North Sea. Hopefully by briefing it'll be nice and sunny. We await our inhouse weatherman to offer his perspective. At the 10:30 briefing, after all the admin stuff, Nils Wedi the weather man presented the forecast for the day which was summed up in a short sentence..."It won't be flyable today". Various diagrams were then shown to explain why, but a quick look at the shower over the airfield was probably sufficient for us to recognise Nils's forecast as being spot on. On that basis Mike Collett, the Competition Director, declared the day to be scrubbed. The forecast for tomorrow is much more promising. Initial indications are of a 3,500' cloudbase but with quite strong winds. Wind strength is something that's likely to remain fairly consistent for the whole competition. That said, it's only a forecast so it could all change! And the competitors are rolling in to register, kit is being prepared and the clubhouse is a hive of activity. Unfortunately the weather doesn't seem to quite as enthusiastic and the outlook for the day isn't promising. Nonetheless everyone is looking forward to the competition. The Hutter - all 9.7m of it. Early sunshine gave way to overcast and the threat of rain, so no cross country pilots appeared, and they missed the excellent afternoon of sunshine and thermals which kept us busy with club flying - David H did an hour in the K18 for his bronze and cadet Mike Gatfield passed his field landing check and now only needs another hour's flight to get his bronze so he can set off cross country. 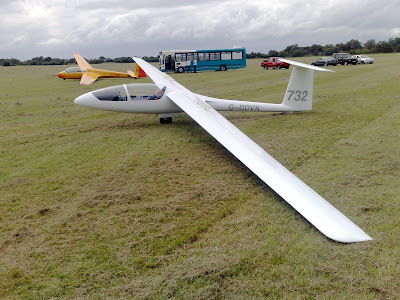 We were also treated to a display of vintage gliders with the Vintage Gliding Club's Whispering Wardrobes weekend. Graham's elegant red Petrel and Nick's improbable-looking 9.7m Hutter were among the gliders to appear at the launch point. And here's another.